Today, coming home from a prairie trip, Kathie and I stopped to look at the prairie installation at the place where the Madison Southwest Bike Path crosses Odana Road. This prairie is an outstanding small prairie, and must be a joy to bikers travelling through the area. The diversity is high, and it is completely weed-free. 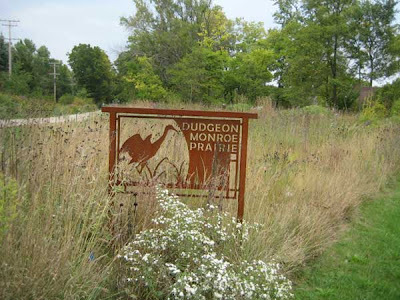 I know that the folks involved in installing this prairie are active members of The Wild Ones, an organization that promotes the establishment of native plant communities around homes and businesses, using ecologically sound practices. The Wild Ones also promotes biodiversity and has a strong educational component. This organization was established in 1977, and starting from a small base of seven members now has thousands of members in 27 chapters serving 12 states. There is a Madison chapter, as well as chapters in other parts of Wisconsin. I love the sign in the above photo. 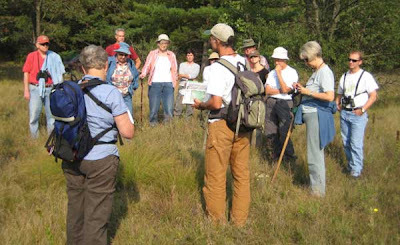 Today Kathie and I joined a group of Natural Resources Foundation members on a trip to Mazomanie Oak Barrens State Natural Area. This trip, led by DNR Conservation Biologist Matt Zine, gave us an overview of what an oak sand barrens is like. The oaks here are mostly black oak (Quercus velutina), with an occasional white oak. This site is near the Lower Wisconsin Riverway and sits on top of a huge glacial sand deposit resulting from major flooding of Glacial Lake Wisconsin at the end of the last ice age. We saw lots of great dry prairie/savanna species such as downy gentian, goat's rue, lead plant, silky and sky-blue asters, gray goldenrod, coreopsis, big and little bluestem, Indian grass, and three-awn grass (Aristida sp.) Also, the group here is surrounding a very nice patch of prairie dropseed (Sporobolus heterolepis), one of the conservative prairie species that is a good indicator of excellent habitat. Mazo Oak Barrens is a diamond in the rough, as it needs a lot of help. As a DNR-owned State Natural Area, its management falls under the aegis of the Wisconsin Bureau of Natural Resources staff. Unfortunately, the field staff is overburdened with too many sites to care for, so that some triage is necessary. The part of Mazo Oak Barrens where the photo was taken had not been burned for about 15 years. It is impressive that the site is in as good a shape as it is. This is probably because it is such a dry site, and is not favorable for the development of a lot of invasive species, although we did see occasional patches of buckthorn and honeysuckle. Fortunately, there were very few invasive weeds. The Natural Resources Foundation of Wisconsin is a nonprofit membership organization founded in 1986 and dedicated to providing support for conservation work by the Wisconsin DNR. It is an organization that well deserves support of all citizens of Wisconsin. Milkweed bugs are easy to raise and because of this are used in quite a few undergraduate biology courses. That's fine, but I'm not happy about them decimating our milkweed seed pods. We get few enough pods as it is, and I hate to lose good seeds to this specialized grazer. Milkweed bugs are themselves relatively resistant to attack by birds or other predators. 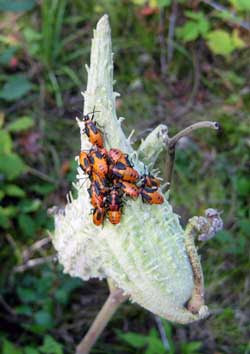 The reason is that milkweed bugs are full of the toxic alkaloids that milkweed plants produce. If a bird takes a taste of a milkweed bug, it is immediately repelled by the awful taste. After a while the bird learns to recognize these bugs and doesn't even try to eat them. I am most concerned about the effect milkweed bugs might have on purple milkweed (Asclepias purpurascens), our endangered species. We have had a substantial infestation in our forbs garden, but so far the plants in the field have not been affected. However, I have seen them in the field on poke milkweeds, a species that has a similar habitat to purple milkweed. It's not surprising to see these large infestations, as the female can lay as many as 30 eggs a day and up to 9000 eggs during her lifetime. I was amused to note that in the biology classes they don't even need milkweeds, as they can raise milkweed bugs on cracked seeds of sunflower, watermelon, squash, etc. We have always had a fair bit of hazelnut (Corylus americana; also called American filbert) in our savannas and have felt this is a "good" species to keep. The fall color, for instance, is outstanding. It is often mentioned in the surveyor's notes in the Public Land Survey for southern Wisconsin, so presumably they considered it a good plant also. It forms edible nuts, although at Pleasant Valley Conservancy the squirrels usually get them before we do. However, in a recent survey of one of our nice white oak savannas, I noted that hazelnut has spread quite a bit. I am starting to worry about whether it might "take over" the savanna. This savanna has a lot of good species, including cream gentian, culver's root, various savanna and prairie grasses, lion's foot, purple Joe Pye, purple and yellow hyssop, asters, and goldenrods. But since hazelnut forms an extensive rhizome system, it is forming large patches which are beginning to crowd out these good plants. Although hazelnut is fire sensitive, it readily resprouts after fire. Also, in several of our savanna areas, the hazelnut cover is extensive enough so that fire doesn't burn through. In a few years, I am afraid this shrub might be towering over my head. In our savanna areas we have had an ongoing brush control operation, focusing on exotics such as honeysuckle and buckthorn. But we have been leaving the hazelnut. Now I am starting to worry about whether we might have allowed it to go too far. 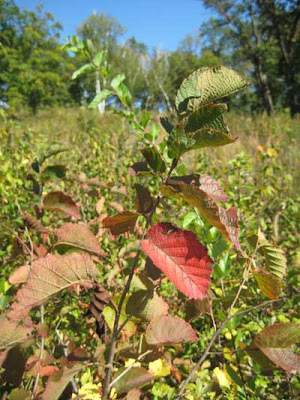 Research at Cedar Creek Natural Area in Minnesota has shown that hazelnut can dominate the understory in oak savannas. For instance: "Our results suggest that fire-dependent ecosystems may be more vulnerable to shrub expansion, due to the resprout capabilities of shrubs after single disturbances and high light availability. We recommend monthly clip treatments during the growing season to effectively manage C. americana expansion, either with or without prescribed burning." Brian D. Pelc, Peter B. Reich, and Rebecca A. Montgomery. Universityh of Minnesota. I'm not sure we would go as far as monthly clip treatments. I would rather contain its spread from some of the savanna areas by killing the spreading edges of the clones, enough so that they were held back. This is aster season and lots of species are in full flower. At Black Earth Rettenmund Prairie I saw smooth aster (first photo; Aster laevis) and silky aster (Aster sericeus) in full bloom. Smooth aster is fairly showy. It usually stands tall and produces lots of flowers. It also grows well in native plant gardens, which makes it a good candidate for cultivation. 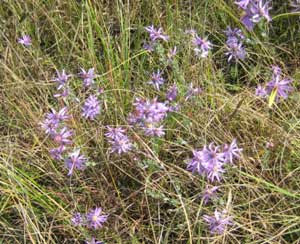 It is found in dry mesic to mesic prairies, and is one of the foundation plants in any prairie planting. Silky aster is a real dry prairie plant, growing well on bluff prairies and various other dry sites. It gets its common name from the "silky" sheen of the underside of its leaves. According to Cochrane and Iltis, this species is less common than it once was, surviving primarily on "goat" prairies. However, it does do well in plantings. Saturday I saw some nice stands in the dry-mesic planted prairie at Goose Pond. Saturday we had another fine day collecting seeds at Goose Pond. It was an interesting group, some novices and some old hands. 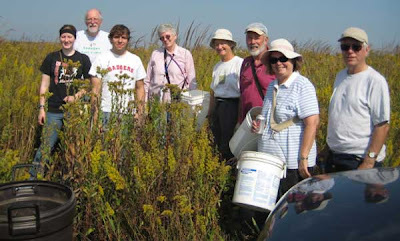 My photo here does not show the whole group, just those who were collecting with us at a special prairie. This was a three-year-old planting which had been especially planted to emphasize dry mesic prairie plants. There was little grass, which made it lots easier to collect. We collected tall cinquefoil (Potentilla arguta) and Canada milk vetch (Astragalus canadensis). Both were really ready to collect. The cinquefoil in particular just poured out of the seed heads into the collecting bucket. There was a real lot of it to collect, and two large garbage cans were full by the time we had finished. Two students in the group were taking a course at U.W. Madison that required participation in a volunteer project. Since they liked the outdoors, they choose Madison Audubon. Neither had collected seeds before but it doesn't take long to learn. Sunday Kathie and I led a seed collecting group of 8 people at Black Earth Rettenmund Prairie. This State Natural Area is only 16 acres, but really high quality acres. There we collected a large variety of seeds, including wood lily (a Rettenmund Prairie specialty), short green milkweed, butterfly milkweed, naked sunflower, flowering spurge, big bluestem, rosin weed, compass plant, coreopsis, and a few others. For this sort of collecting, you need to carry two buckets and in addition have some empty bags, both small and large. At the end of three hours we had a very satisfying array of seeds. They are now drying in the barn, and will then be cleaned and stored until planting in November. We have been restoring Unit 10, one of the bur oak savannas, for about 9 years. It started as a fine stand of open-grown bur oaks that was completely overgrown with buckthorn and invasive trees. It had very few forbs and no grasses. The first year we tried to burn it, it did not burn at all. The second year it was slightly better. We started clearing in 2000, and began almost immediately to overseed with native species collected elsewhere on the Conservancy. Our yearly routine has been to burn, plant seed, monitor in the spring and summer, weed, remove buckthorn resprouts, and continue monitoring. We have also worked to control the extensive bramble populations that developed. We have burned in either spring or fall, and since 2004 have had some good burns and some spotty burns. We started seeing prairie grasses about three years ago, and they have been spreading ever since. The most obvious is Indian grass, but little bluestem is also present. In the shadier areas we also have savanna grasses (silky and woodland rye, bottle brush grass, woodland brome). We also have lots of forbs, and the species count for this unit is over 100. Among the forbs we now have good populations of cream gentian, showy goldenrod, and large-flowered false foxglove (which grows semiparasitically on oaks), among the more common species. It obviously takes time to restore a savanna, but persistence pays off. Unit 10 has the potential of being one of our finest savanna restorations, but we must keep on top of it. Heath aster (Aster ericoides) is now in bloom. This dry-prairie plant has a stem/leaf structure like a Brillo pad, which is probably where the common name comes from. It has a dense cluster of bright white flowers, and in a brilliant sunny day such as today its flower heads fairly glow. This is one of the late-blooming plants of autumn, although vegetative plants are visible early in the summer. I assume it is a short-day plant, and initiation of flower bud formation does not begin until the days start to get short. According to my phenology, it is one of the last species to flower in the fall, some plants still showing fresh flowers as late as the end of October. There is nothing rare about this species in Wisconsin, although it is listed as endangered in the state of Tennessee. On the other hand, it is said to be invasive in Nebraska and the Great Plains. 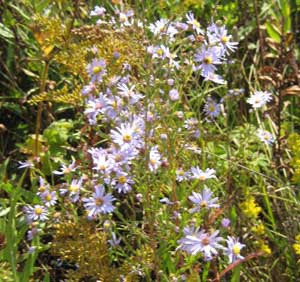 Some people may be dismayed to learn that botanists no longer use the genus name Aster, although it is still used as a common name. What used to be Aster is now called Symphotrichum. I'm willing to use "some" of the new Latin names, but I plan to stick with Aster. As somebody once said, "the plants don't care what their names are." 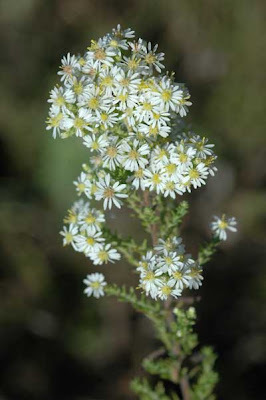 When it is in a favorable habitat, heath aster can form large patches, spreading by means of underground rhizomes and stolons. 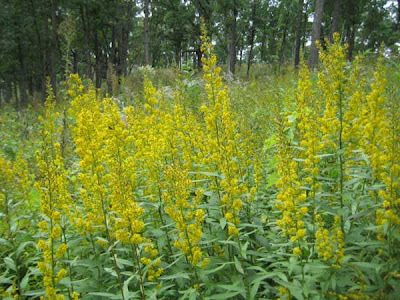 I have seen patches of 6-8 feet in diameter, although it never misbehaves the way Canada goldenrod does. At Pleasant Valley Conservancy, heath aster is most common on our very dry south-facing slope, although it also can be found in other places. The photo here was taken in the south unit of Toby's Prairie, which does have a slope to the south and gets fairly hot in full sun. Gray goldenrod is sometimes called "nodding" goldenrod, because its flower head hangs to one side, appearing to be nodding. It is a short goldenrod and most common on dry prairies, where it can compete well because most other species are short. There are several subspecies here, and I'm not sure which one we have. All of our stock is derived from a single population that was native to the original dry prairie remnant (Unit 1). As the summer flowers disappear, lots of butterflies are disappearing also. 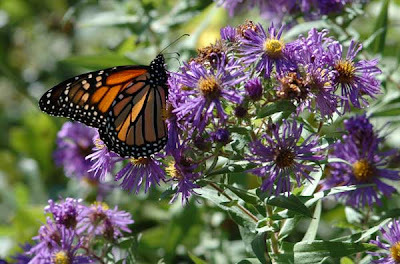 The Monarchs are still around but are spending their time fueling up in preparation for their fall migration. Today at Pleasant Valley Conservancy a butterfly aficionado saw 50 Monarchs feeding on a large patch of New England aster (Aster novae-angliae). I missed that view but did manage to get a nice photo of a single Monarch working over a nice patch of the aster. New England aster is a fairly common aster, and lots of botanists tend to snub it, but it is certainly one of the handsomest asters of the fall flora. We have it in both our prairies and open savannas. Interestingly, we have two color phases of New England aster, the deep purple shown here, and a lighter, more reddish color. Both seem to occur in the same areas, sometimes side by side, so I assume the color variation is genetic. Monarchs (Danaus plexippus) are fairly common and the butterfly folks don't get too excited about them, but they are readily identifiable, and their fall migration is a fascinating story. Many of the migrating Monarchs end up in a Mexican mountain area which has now been turned into Mariposa Monarca Biosphere Preserve in Michoacan province. I did field research in that province 35 years ago; at that time it was very primitive and undeveloped. Now, I'm sure it is vastly improved. I hope not so much improved that the Monarchs are in danger. American elderberry (Sambucus canadensis) berries are now ripe. We have lots of elderberry bushes, mainly in the more closed areas of our savannas, and this year they have really flourished. The berries are literally dripping off the stems, and if you aren't careful your hands turn purple. 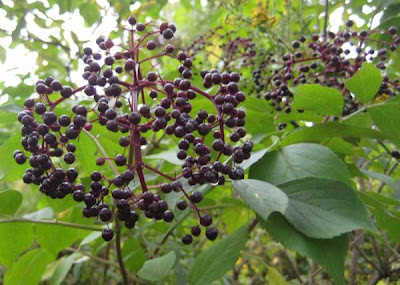 Two years ago we had a striking fungus disease of our elderberries, and the causal agent was identified by the U.W. Plant Pathology Clinic as Puccinia bolleyana. We actually had most of our elderberries near our wetland killed off by this fungus, although at our upland sites it was much less serious. The photo here was taken in Unit 21, which seems to be rust-free. This unit is a north-facing woods on a steep hill. There are lots of elderberry bushes here, and they are all full of berries. It was interesting to me that we had a very good burn through the area where these bushes have done so well. I assume that because it was north-facing, the fire was not too hot, so the bushes were not top-killed. Showy goldenrod (Solidago speciosa), one of the later blooming goldenrods, is now in full bloom. Although often thought of as a prairie plant, it also thrives in our oak savannas. All of the showy goldenrod plants here are native to the site. Originally we had showy goldenrod only in a small prairie remnant at the east end of Toby's Prairie. We collected seed there and used it in our various prairie plantings. But in addition, we added it to what we call our "open savanna" mix. We started seeing showy goldenrod about three years after first planting, and it is now well established. According to Cochrane and Iltis, it is found in bur oak openings, which is just where this photo was taken. Showy goldenrod is a perennial, but grows in multiple-flowering clumps (the botanists call this growth form "cespitose"). These clumps start with one or two stems and gradually expand. 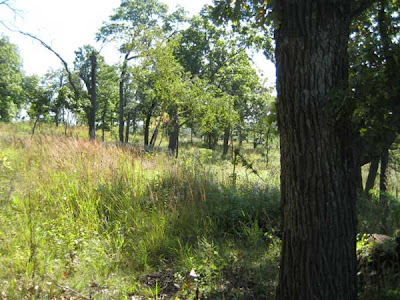 The photo here is from a substantial clump in the white oak savanna which is probably 8 years old. We have it growing now in every one of our savannas. 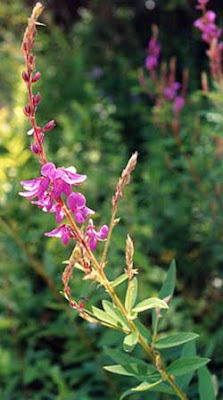 As the photo shows, Canada tick trefoil is a stunning plant when it is in flower. Unfortunately, it also sets seeds, which stick to everything that touches them. Now that we are in seed collecting mode, every day we are faced with the task of taking them off clothing. I have heard of all sorts of ways of dealing with them, but the only way I have found that works is to pick them off one by one. Sometimes this takes a half hour or more. No fun. Yesterday I was collecting a great patch of cup plant. The cup plant seeds were superb, but unfortunately I had to wade through tick trefoil to get to them. As you walk you can feel the "tug" of the seed head on your clothing, and you know what you will be in for later. 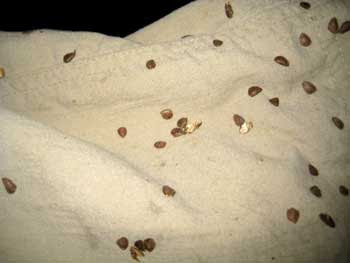 Some people can't stand to have their clothes full of seeds and start to pick them off right away. Somehow that seems futile to me, as I'm sure I will get more before the day is out. I wait until the end of the day and pick them off all at once. One thing I don't do is bring my seed-laded clothes upstairs. I have a spot in the basement where I work on them, and a special wastebasket they go in. Even with all the caution, I still keep finding tick trefoil seeds all of the house. How do they get around? We have been collecting seed since the 4th of July, but now the pace is getting intense. This year we have moved our seed cleaning operations from Madison to the barn at Pleasant Valley Conservancy. We have lots more room here, and we avoid getting dust and insects all over our house. Our seed cleaning equipment is all hand-driven, but is really quite sophisticated. Kathie picked up a set of screens several years ago and our friend William made a great set of screens for us. The wooden frame fits precisely into a Rubbermade storage bin, and it is quick work to pass the dried and hammer-milled material through a screen. Each seed has its own size, so the ten screen sizes we have all come in handy. We don't need highly cleaned seeds of the type that can be purchased commercially, so our goal in cleaning is to get rid of as much extraneous material as can be easily removed. If we can get 90% clean seed that is great. By the end of the seed collecting season we should have well over 100 species, some in pound lots. By Christmas or earlier, most of these seeds should be back on the ground. When we drove down Pleasant Valley Road this morning there was a whole cluster of young pheasants wandering around. 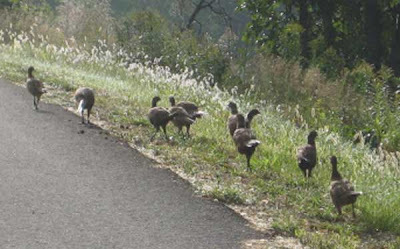 We slowed, then slowly creeped up on them, with Susan snapping photos out of the car window. An instant after this photo was taken they all disappeared over the side of the hill into the tall grasses of the Valley Prairie. In years past we have often heard pheasants but have rarely seen them, but this year they seem to be all over. Perhaps they like the favorable lush prairie vegetation. Many people plant "food plots" for wildlife such as pheasants, ten rows of corn, for instance. We have been content to design our prairies for high plant diversity, and let the wildlife forage for themselves. Obviously, the pheasants are happy. We have also seen many young turkeys this year, as well as young red-headed woodpeckers, kestrels, and bluebirds. The sandhill cranes that normally nest on our wetland were flooded out twice, and have not been able to raise their young. Yesterday afternoon a group of Prairie Enthusiasts collected seeds at Black Earth Rettenmund Prairie. The weather was perfect and the seeds were plentiful. 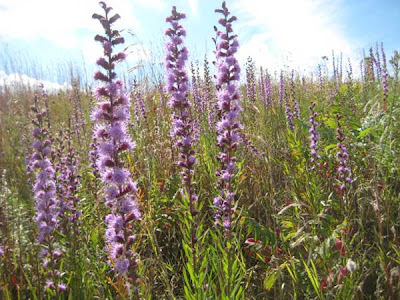 In addition, we were all rewarded by the best display of flowering blazing stars we had ever seen at this prairie. I assume the very wet weather in early summer was (at least partly) responsible. Seed collecting is probably the most fun of the various tasks involved in prairie restoration. And collecting seeds at Black Earth Rettenmund Prairie is a joy, because it has such a wide, interesting variety of species, and access is so easy. Although a superb dry prairie remnant, this isn't one of those steep bluff Wisconsin prairies. The prairie is on relatively level ground, an unusual situation. See this link for details on the prairie. Seeds we collected today included lead plant, tall prairie cinquefoil, big bluestem, rosin weed, thimbleweed, side oats grama, prairie brome, showy sunflower, butterfly milkweed, and coreopsis. We are planning another seed collecting workday for Sunday, Sept. 21, when more species should be ready, plus more at later dates. Anyone interested should fill out the contact form on this web site. Among the good prairie plants I reported on then that showed significant fall regrowth were rosin weed, pale Indian plantain, yellow cone flower, columbine, alum root, and prairie violet. I also noted several "bad" plants that showed fall regrowth (or just growth, it doesn't matter here). These were: Canada thistle, sweet clover, hedge parsley, and spotted knapweed. I pointed out that this fall regrowth provided us with an opportunity for control, since they can be sprayed with glyphosate. Others not on this list but applicable are reed canary grass and garlic mustard. Fall spraying with glyphosate is a boon, since most of the good plants have senesced and are brown. They should not be hurt by this herbicide, which also has the advantage that it is inactivated by soil particles and hence has no residual in the soil. We have major plans this fall to spray everything bad we can find. Every plant killed this fall is one we won't have to deal with next spring! The June 2008 flooding had brought about some interesting changes at Goose Pond (the pond is now a "lake"). However, the principal seed collecting prairies are fine, and we were able to bring in quite a few seeds. 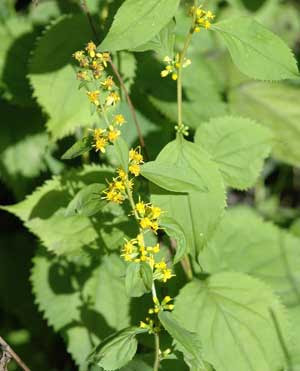 The species collected were: side oats, flowering spurge, Illinois trefoil, and golden Alexanders. Golden Alexanders (Zizia aureus) is a very fine spring prairie/savanna species, flowering in late May and early June. A member of the carrot family, it has bright yellow seed heads (umbels) which provide lots of color in the late spring/early summer growing season. At present, it is being dwarfed by the summer/early fall members of the tallgrass prairie, making it fairly hard to find. We had to redirect our thinking and look for carrot-like seed heads that were only three foot high (if that, many had fallen down). Some of the heads had already lost their seeds, and we had to be careful to not knock off the seeds of the ones we were collecting. The technique here is to grab together three or four heads, cut them with a clippers, and lower them directly in the seed bucket. Even being careful, it was difficult to get all the seeds in the bucket. The photo below shows only part of the "catch". 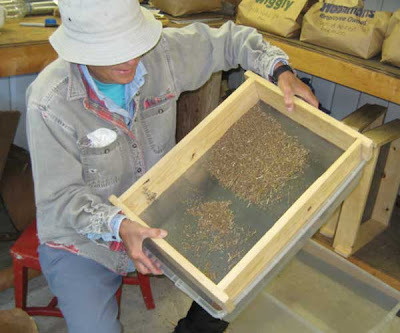 To clean the seeds, they will be first run through the "hammer mill" to shake the seeds off, and then pass the milled material through a fairly fine screen. I was interested to see that although the seed heads were very dry, there were lots of green leaves of Zizia aureus growing close to the ground. Since this plant grows vegetatively in May, where did these fresh leaves come from? A number of the early flowering prairie plants have a second growth phase in the early fall, after days are starting to get shorter. I haven't seen much literature on this phenomenon, but I assume that during this fall growth phase the nutrients produced are translocated to the roots and provide a boost for the following spring. In addition to Zizia, I know that bird's foot violet also has a fall growth spurt. 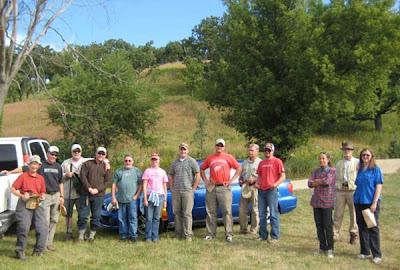 Today we had a nice visit from the restoration specialists at the McHenry County (Illinois) Conservation District. Conservation Districts (some of them are called Forest Preserves) seem to be an Illinois specialty. We don't have anything like them in Wisconsin. These county conservation districts own 170,000 acres of preserved land in Northeastern Illinois. These are not "parks" but natural areas and they are separate from the agriculturally focused Soil and Water Conservation Districts. McHenry County owns over 22,000 acres of prairies, savannas, woodlands, wetlands, and open spaces. This land is cared for by a professional team of restoration and management specialists whose job is to protect and enhance the natural areas. It was this team that visited us today. I like their mission statement: "The McHenry County Conservation District exists to preserve, restore, and manage natural areas and open spaces for their intrinsic value and for the benefits to present and future generations." The focus of the visit was on our savannas and how we are restoring and preserving them. Over a 2 and 1/2 hour hike, we had nice discussions about control of invasives, seed collecting and planting, prescribed burning, and recovery of oak savanna structure. Many of our problems were similar, and sharing ideas is very important. I was asked why Wisconsin had never adopted the Conservation District concept. Good question. It seems a natural for a state with such a strong environmental focus. Perhaps we are handling these problems in other ways? At the end of the tour, the leader told me that our site was "awesome". Nice! Our annual Labor Day field trip was held yesterday. Twenty people attended. The weather was warm (actually hot), but a light cloud cover helped keep conditions bearable. One of the traditions of this trip is to co-opt any willing participants to collect some seed. On the south-slope shortgrass prairie, side oats grama is collected. 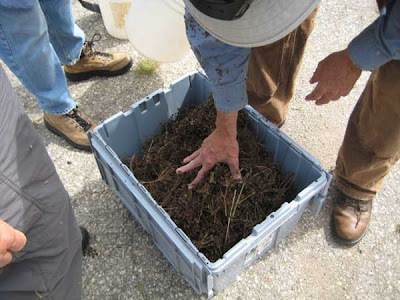 In the savanna, bottle brush grass is collected. 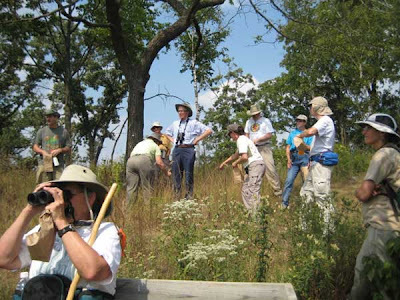 The photo above shows some folks collecting side oats on a small restored prairie at the top of the ridge. We got a lot of useful seed! Conditions have been brutally dry for the past month. The Conservancy actually looks better than could be expected with these conditions, probably because of the heavy rains we had in June. The deep-rooted prairie plants are probably doing all right, and the savanna species, less deep rooted, are probably doing all right because they are in partial shade. We have suffered through month-long droughts before. Three years ago it did not rain a drop between mid August and mid September, a whole month. One consequence that year was that our little bluestem grass did not make seed. We'll see what happens this year.